When I moved to Melbourne I planned to do a lot of writing. I imagined that this would be my biggest challenge and in a lot of ways it has been. For quite some time I found I couldn’t write. I’d get up in the mornings and sit at my desk ready and willing but no matter what I did, the words refused to join me. It was terribly distressing; I felt like a failure. It didn’t make sense. I knew what I wanted to say and was prepared to put in the hours, but it was as if the timing wasn’t right, as if the words weren’t ready. I didn’t just sit there of course, I did write some things. But everything I scribed seemed clumsy and jarred. Kind of like someone had taken a song I knew well and then played it back, slightly out of key. And then poetry reared its pretty head. On the day it arrived, writing became easy. Now I can sit and pen two pieces over my muesli. It’s like whatever wind is blowing them in will not be stilled or quieted. Unfortunately, poetry takes a person nowhere but to the warm cave inside of themselves. It’s awfully snug, but it’s not the type of writing that can be rationalised; there’s no chance these words will prove in any way self sustaining. And now I have a bigger problem. I am running out of money. Surprisingly, finding work in the city is difficult. Initially I’d imagined that supporting myself with casual teaching would be simple. I visited stacks of schools and was sure I’d soon begin to hear from them. I started waking at six am in anticipation for the phone call and I would iron my clothes in the evenings in readiness for a last minute rush. But no one rang. I sent follow up emails and heard nothing. I broadened my scope by venturing further afield and still the line remained silent. The dwindling of finances has left me certain that contentment doesn’t come from opting out. Being poor is stressful. Jobs are necessary. The challenge isn’t in figuring out how to avoid work, but rather finding an occupation that will allow you to keep the actual fire burning while also fueling your spirit, making your insides warm. I miss working. I enjoy time spent writing but I miss the sharing. I miss other voices and the laughter. I miss making someone else a cup of tea and seeing the smile that thanks me. Truly, writing can be such a lonely pursuit. So a couple of weeks ago I decided it was time to begin to change some things. More than anything I suppose it was necessity that began to bump me outside of my box. I began applying for all types of jobs; not ones for which I’m acutely qualified, but ones I could imagine enjoying. This fortnight I have applied for upwards of ten non teaching jobs and I have grown unexpectedly excited by the prospect of being granted the opportunity to try something completely different. This sudden feeling of hopefulness and exhilaration has led me to realise that somewhere along the line I’d lost track of what this year was about. To an extent, I’ve been waiting for fulfilment to kind of just rock up and join me while I go about the business of living. But I was being silly. If you want to be happy, you’ve got to bring it about for yourself. I don’t know why it’s taking me so long to realise that being passive doesn’t make things happen. I truly am the slowest of learners. In the twenty first century it’s estimated that a person experiences an average of seven careers within their lifetime. These evolutions aren’t necessarily all radical; they may involve a promotion, for instance, or a change of duties within a profession. But the bottom line is that movement is an entirely normal element within the employment sphere. I’d come to this city searching for a change in scenery. It’s well and truly time to experiment with something new. Some time after starting this journey, I forgot the point to it all. I’ve been dwelling on my need, rather than seeking my solution. This week I’ve come a little closer to synching with my purpose. And it feels good. Have you undergone a career change during your working life? Were you glad that you did? One of my many loathings is societal conditioning. Yet at the same time, I can’t help but admire the genius that devised the conspiracy. From day one we are programmed to contribute to the machine. When we are infants we are sent to school and the training begins. We’re taught maths and spelling and the position of America on the map, but most importantly we learn to do what we are told. Wear your uniform. Arrive on time. Follow the rules. Funnily, it takes only the most minimal and pathetic of recognitions to maintain these behaviours; a worthless commendation, a passing word of praise. In no time at all, we’re hooked. We are indoctrinated so thoroughly that before long we begin to see those who do not entirely conform as pathetic failures. Those who take a day off here and there because they can’t be arsed doing something which seems to them utterly superfluous are frowned upon en mass. The guy who wears what in the hell he wants because he reckons the school administered blazer looks ridiculous is chastised and outcast. Why is he refusing to follow the rules? Eventually we either drop out of school or graduate. Some are lucky enough to have fallen for the scam and actually celebrate the fact that they are finally free whilst arranging their ties and passively preparing to head off for another colourless day in the office. The less fortunate of us are more than aware that we are trapped. We are the ones that hate ourselves, because despite the most conscious of realisations, we do it anyway. I just figure it would be better than the reality of a decade of life wasted when in ten years time, I’m still miserable. We only get to live once, right? Should our single aspiration really be to have a great big house, a dependable job and financial security..? I, for one would prefer to have a bloody good time. And yet I haven’t quit yet. Go figure. Last week I was quite ill. High on the dopey fuzz of cold and flu medication, I used the down time to restore some semblance of order to the many document files I’ve confused with obscure thoughts, unrealised ideas and the incomplete ponderings of my scattered mind over the past few years. During the reading and deleting process, I stumbled upon the above rambling. I suspect that younger me would be both pleased and surprised to learn of the changes that have transpired since the moment when, in her hopelessness, she penned this piece. If the feelings of my present self are indicative, it’s a fair certainty. When I decided to run away at the end of last year, throwing in my job to commence a desperate search for contentment and meaning, I had never felt so alone. At the time I was convinced I was the only person to have ever experienced the poignant feelings of failure and inadequacy that were undermining my identity. Yet from the moment I began writing about my journey, I became aware of an entire generation of people in the same position; feeling despondent and confused. Believing, as I did, they were lonely islands. Since the commencement of this year, I’ve received many emails and messages from people who’ve been where I am. Sadly, due to commitments and responsibilities, many find themselves in a state of stuckness, unable to break from the blue. But others answered the call for change and have shared stories of wonderfully positive personal outcomes. There’s no shortage of research on the subject of the quarter life crisis. In fact, scientists and psychologists agree that the condition is nearing epidemic standards in the western world. Growth in levels of insecurity and depression are now affecting approximately one third of people in their mid twenties to early thirties, with educated professionals deemed most likely to suffer. As well, we’ve been raised by a media obsessed with granting us the empty promise of limitless possibilities. From the youngest of ages we’ve passively received the message that success means achieving everything. All at once we crave celebrity, yearn travel, strive to look excellent, desire to be experts in our field, attempt to develop and maintain quality relationships. This perception of what it means to be successful inevitably leads to a period of radical disillusionment when the superman mentality proves impossible. At this point, we’re either broken by our inability to do it all and are left feeling like failures, or else we’re torn by our seemingly unnatural and ungrateful lack of whim to have everything and seek things we don’t necessarily want for fear of being left behind. Thankfully, there are some positive trends for quarter life crisis sufferers. Wonderfully, research suggests that these transitional dilemmas, which typically last around two years, often lead to individuals building and concreting for themselves greatly improved lives. Researcher Doctor Oliver Robinson from the University of Greenwich in London posed four stages for the quarter life crisis. The first is characterised by an illusory feeling of being trapped within a job or a relationship; logically you know you can leave, but emotionally you feel that you can’t. The second begins with the realisation that change is possible, leading to emotional conflict and upheaval; a difficulty which proves a vital catalyst for positive change. The crisis then shifts into its third stage; the structuring of a new, alternate life and seeking broader personal clarity. The fourth and final stage consists of cementing fresh commitments which more closely reflect your inherent interests, aspirations and values. Experts suggest that the way to emerge from the crux of a quarter life crisis is to plan for success and make clear goals. If you feel you don’t have enough direction to make long term goals, they suggest you start with shorter termed ones and work your way up. Having a creative pursuit has been found to help people through quarter life crises, providing an emotional outlet as well as a medium through which to explore and expose thoughts and feelings. Experts propose using this time of transition to pursue interests and the things you’ve always wanted to do. And of course, if you feel you need professional guidance, don’t hesitate; seek it. In life, we only ever get that for which we ask. Though I currently feel no less lost than I was four months ago, I’m beginning to feel much more hopeful and certainly less alone. I truly think we’re going to be okay, guys. When I’m feeling particularly confused, I find it helpful to remember some words an old friend once gifted me. She said that nothing that is for you will ever go past you. So que sera, sera; what will be, will be. Just make sure your eyes and palms are ever open, quietly waiting. If you’re interested in reading more, here are a couple of the articles I read while perusing the subject. When I was small, my father went through a shameless country music phase, and as a result, so did I. Now an adult, I sometimes like to listen to those songs, permitting myself an occasional and clandestine appointment with my past. Somehow those melodies with which I was inadvertently raised can call to life the moments enjoyed by my younger self, and I’m warmed by how brightly my family burned before our fire went out. Those songs muster images of my mother standing in a faded sundress beside an old brick barbeque in the back yard, separating a string of sausages with a blunt butter knife and tossing them onto the hot plate. My father moves between the kitchen and the picnic bench for utensils and margarine, setting the screen door banging. They laugh with one another. The air is filled with the smell of sizzling fat and flowering jasmine, and my siblings and I circle the crooked drive on dinkies, while John Williamson blasts through open windows, filtering through the fence and into the midsummer streets of suburbia. It was within these moments that my smaller self learned what family looks like, what happiness sounds like, what togetherness feels like. But that music stopped playing when this accidental thing my parents made was broken. In the years that followed, now and again on balmy evenings my father would play his country tunes, and the older versions of our selves would cook a meal outside. But the mood was different; in our own ways we all knew where those songs belonged. Once something breaks, it will eventually begin to crumble. Yesterday I learned that recently, my mother remarried. I stumbled upon the photographs on the internet, and saw her standing beside a man I’ve never met, voicing a new vow. It’s true she’s not the woman from my past, but her eyes, the first to ever lock with mine, remain the same. And with her in the pictures is my sister; one who used to be mistaken for my twin and who now believes these things are not for me to know. For a reason I cannot understand, she chooses to deny the inextricable link we all share and which like it or not, cannot be severed. All I can do is shrug my shoulders and refuse the sting of a mother who wanted something else and a sister who could not bear to be left behind. Turning up the music I revisit the times before the cracks and the crumbling. Back when we were pieces that belonged together, and who were willing to share a route around warm concrete in the evenings of our childhood. Listen, sister. Remember. The weekend after I turned sixteen, my mother showed up. Sure, she’d missed the big day, but then we never did dwell much on ceremony and anyhow, until then she’d overlooked every scarring ricochet in my skewed trajectory towards womanhood. Without her along to show me how, I’d been wearing my new found femininity as if it were two sizes too big; shuffling along in a flush of feigned flippancy. So after twenty two months silent, I was surprised and secretly pleased to know that she’d remembered without prompting the day, sixteen years earlier, when I’d been cut from her stomach and lain, blue and bawling, on her naked breast; the first of three rude shocks to be placed there. This was our anniversary. And she had come. After sharing our space for a few days, we understood that she’d soon be gone. Then on the third night, she pulled me aside. Following her into my bedroom, we sat beside one another on a sagging foam mattress while she rifled awkwardly through her bag, uncovering a book filled with poetry and proffering it to me. For the briefest of moments, I caught my mother peering tentatively from behind a shield of false confidence to observe how her toughened daughter would respond. Bewildered, my guardedness fell away, making space for recognition at the sight of her poorly painted mask, as if catching a shaky reflection in a tainted pane of glass. She stared at the empty palms lying in her lap. I looked at the book. Letting it fall open I found the words she’d inscribed on the inside cover. Like mist in the morning you came to me, showering me with love. And I took it all in; as does the grass. Clearing her throat she took my hand, and held it like a resignation; light and loose and absent. A ticket for a ship that’d long since sailed. She said nothing. The following day she was gone. For my sixteenth birthday my mother gave me poetry. But despite countless hours cradling that book of words, I’ve not had the heart to page past the naked lines she penned; an exposed underbelly of romantic sentiment. A silent revelation of my mother’s best intentions. 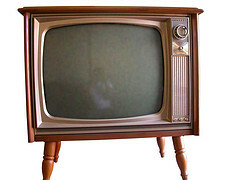 In our house growing up, we were never allowed to watch commercial television. In fact, it’s almost true that I was unaware stations other than the ABC and SBS existed before I was old enough to begin sleeping over with friends. In any case, I was completely ignorant as to the content they broadcasted. Dad was insistent that if we were going to watch tv, the things we viewed be educationally beneficial, or at the very least wholesome. Starved of the sensational, we’d rise on Saturday mornings before he was out of bed and with the volume down, flick through the channels to watch the programmes aired on other networks. At this time of day it was only ever cartoons, but nevertheless the niggling guilt would gnaw at my grey matter; it was commercial garbage and it was destroying our minds. Nowadays I don’t own a television, but if ever I find myself watching something intellectually redundant, whether it be a poorly scripted film or a mindless video on YouTube, the all too familiar voice my head loses no time in informing me that I’m polluting my brains and wasting precious time. Increasingly over the past month that nagging madness of my conscience has returned with a chorus of modified chants, demanding I articulate exactly what I’m doing with myself and to what end. I guess I should be thankful for the respite offered by the two month grace she gave me for settling in after my move, but she’s well and truly arrived now; baggage in hand and expecting answers. The year is lapsing, she points out, yet I’m still unemployed and no closer to discovering the meaning of life, or whatever it was I’d come here so adamant about finding. So what exactly have I been doing? I’m growing anxious again and the self doubt is back by the bucket load. Is it wrong to be seeking? Does whatever it is I’m hoping to discover even exist? Is this year going to pay off, or is it nothing more than an epic waste of my time? I keep thinking that if I’d worked this year, rather than running off on some kind of self indulgent pilgrimage, by the year’s end I could have saved a house deposit. And all the while, the ceaseless mantra of my inner voice drones on. She’s pulled up a pew in the shadows, and from there she rehearses her extensive, hugely repetitive and less than pleasant back catalogue; something about time and wasting it. I feel like a kid again, guiltily waiting to be sprung watching Home and Away commercials while there’s an informative documentary on another channel. I went home for a few days last week with all of these worries bubbling just below an apparently stable equilibrium. But after confiding my concerns to an old friend, he told me quite simply that what I need to do is stop fretting and just be. Heard aloud, it seemed blaringly obvious. Surely I just need to get busy living and wait for the moment of dawning and epiphany to rock up to my awesome party. Meanwhile, though I have no answers, it’s fair to say I’m feeling closer; if to nothing else, then to myself. And for the most part I’m having an excellent time, filled with new experiences and good vibes. I’m coming to terms with the fact that since she’s stuck around for the past twenty seven years, chances are the voice in my mind is with me for keeps. And maybe that’s not such a bad thing. Because even if I choose to ignore her, even if she’s rarely right, even if our entire dialogue consists of her criticising and me justifying, it can’t hurt to have someone who’s armed with probing questions and an endless scepticism to keep me from becoming static. Regardless of the fact that she’s just another voice in my head. I’m also realising that the most likely way of figuring it all out is by calming the heck down. What I’m investing in this year is time. There’s little to be gained by tripping over myself, unsettling everything in my path in my desperate plight to uncover some illusive and precious thing. For me, this will be the most difficult lesson; to go steadily, sit quietly, wait patiently, listen. As a high school teacher, I have been gifted a rare insight into the dynamics of the adolescent social clique, and I am pained to witness on a daily basis the many cruel ways that children treat one another. Girls, I am ashamed to say, are the most vicious. I have seen boys literally knocking each other flat as a result of a ‘ya mum’ joke that went too far, but a hard and fast smack to the eardrum does a lot less damage to an individual when compared to the drip, drip, dripping of malicious insults, tapping slowly and torturously onto the forehead of another. Of course, the issue on which I am basing this rant is by no means confined to young people; there are countless adults who can be as callous, if not more so, than the children for whom we are supposed to be setting an example. Unfortunately, as a victim of the pandemic there isn’t a whole lot you can do. I would suggest falling back on your humility with the consolation that everyone present who possesses half a brain realises the speaker is a cretin making a cheap shot at your expense. As the audience however, you have a bit more power in this scenario (no one has instructed you not to take offence, after all). One thing I have found to work particularly well is aiming a ‘no offence, but…’ back at the speaker. In doing this, you must be very careful to ensure that your retaliation has both more bite than the antagonists, and that it references their ridiculousness (so that those people within the circle of conversation who have a even a hint of intelligence can witness your outstanding wit and superior sarcasm). On the occasional blue moon throughout my childhood, our mother would appear unannounced on the door step. Possessed by a sudden wave of bashfulness, we’d stand staring out at her from the hall, with no words to draw her across the threshold. Then, grinning like a Cheshire cat, she’d break the shocked silence with a gregarious gesture and in an instant a silly excitement would sweep through the house. Regardless of how long she’d been gone, we were always devastatingly pleased to see her. After all, she was our mother. Never one for answering uncomfortable questions, she’d coat us with her sticky charm in order to avoid having to admit how long she planned to stay. So we’d hang on her every word, for fear it was her last, and furtively cancel our plans, knowing from experience that it would be while we were away that she’d surreptitiously take her leave. Of course we couldn’t avoid school, so after a few days we’d inevitably arrive home to learn that she was gone. Flattened with disappointment, we’d grieve our loss anew. She never stayed long, but knowing that did nothing to ease the sorrow. As a result of her sporadic and unpredictable pattern of visitation, I developed an agonizing obsession of imagining every car turning into our street was hers, and I spent my early adolescence sneaking shameful glances down the road. It was all I could do to disguise this secret longing for someone I knew would never come. The painful truth was that as hard as I tried to will her to me, she and I were never connected. For me, our mother’s visits were both glorious and wretched. While my siblings would willingly open their hearts like well worn books to the page on which she’d last written, I would covet mine in bitter defiance. I was angry that she could come and go as she pleased while I remained here, needing her. I’d learned the hard way that like a wild wind she’d no sooner arrive than she’d be gone again, and I couldn’t bear it. So during these rare and short lasting visits I kept her at arm’s length. I thought I was protecting myself from further hurt, but regardless of how detached I appeared the pain when she left was no less raw. Since the earliest days of my childhood I’ve struggled with feeling vulnerable. What initially stemmed from a combination of pride and self preservation with regards to my mother is now an integral part of who I am. Perceiving emotional dependence as a brand of personal betrayal, I learnt to greedily guard my weakness. Now I’m wondering whether, had I been more like my siblings, who gladly offered theirs like a gift in open palms, I might possess more peace and contentment. On Saturday I was at my weekly writing group in the city. A broad spectrum of individuals who write for both pleasure and profession, we meet weekly to discuss what we’ve been working on, offering suggestions and constructive criticism to one another. After having completed a five minute warm up writing activity, we’d commenced moving around the table and sharing what we’d written. Before long everyone’s eyes were on me. I didn’t want to share; what if they thought I was dumb? But I choked down the foul tasting fear and the words of decline that were dancing on my tongue and I began to read my work. Against my instincts, I permitted myself to connect. It felt good. I’m realising that if I’m ever going to experience freedom in all its brilliance, I’m going to have to allow myself to be fragile. I know I can do it; I’m courageous. I just have to let go of the fear. I think of how my mother looked as she stood on our front step, giddy with cheerfulness. I couldn’t understand how, after twenty five months of absence, she could show up and act so exuberant. But now I recognise that performance for what it was; a facade behind which she was sheltering her own vulnerability. While standing alone on the other side of the door, a part of her must have worried whether this time she’d be turned away. And she couldn’t bear to let us see how much that would sting. For all those years, I was incensed by her superficiality, but only now do I understand what was happening behind the veil. My mother, like me, was afraid to be truly seen. I’ll close with an offering of wisdom spoken by Brene Brown, a lady who’s spent years researching the subject of vulnerability and whose uplifting and informative presentation I have included for your pleasure. It’s worth a watch; she’s quite the funny one. There’s another way. We need to let ourselves be seen; deeply seen, vulnerably seen. We need to love with our whole heart, even though there’s no guarantee. We need to practice gratitude and joy in moments of complete terror and to just be grateful; feeling vulnerable means we’re alive. And we need to believe we’re enough. When we work from that place, we stop screaming and start listening. We are kinder and gentler to the people around us and we’re kinder and gentler to ourselves. I’ve always had a very clear vision of what my life will look like once I become a grown up. I’ll live in an old, light filled house; the kind where if you leave the front and back doors open, a soft breeze flows right through the middle. It will be a calm house in a quiet suburb, with a white picket fence whose paint is peeling off in lazy flakes. In my house there’ll be a room that’s only mine, filled with so many books that they’re piled in the corners, and a fat couch on which I can sit to read them. Days will pass slowly and I’ll spend them nestled at my desk in a nook near the window, writing glorious words. My house will have red saucepans and floral wall paper and out the back a big garden, where vegetables and flowers will grow in a sort of crazy, hap hazard harmony. In my house I’ll have a border collie whose name will be Mack, and she and I will go running together in the afternoons. And there’ll be nosey chooks that roam the yard and who we are forever shooing out of the kitchen. We’ll string fairy lights along the porch and our friends will visit on Friday evenings to drink bottles of wine. On Sunday mornings we’ll sit on the front steps, listening to vinyls, with bed hair and big cups of tea, and the slightly too long grass will be just one more testimony to our absolute contentment. Life will be so great; I’ll be so happy when I grow up. Ever since ever I was a kid I’ve had trouble living in the current moment, preferring instead to while away perfectly valid years of my life, waiting for things to get wonderful. Impatient as the day is long, I’ve dismissed so much of my present, considering it nothing but a necessary inconvenience which must be endured in order to obtain my fantastic future. Sadly, it didn’t occur to me that by remaining idle I was wasting precious years; that what I should have been doing was getting busy with my here and now. Since downing tools at the end of last year, things have become a lot clearer. In the last couple of months, I’ve done more to actively fashion my life’s canvas than I’d done in the preceding decade. Sure, I’d played some big cards in that time; a visit to Africa, a few sweet moments in Europe. But when I returned from these adventures, I stupidly settled right back into a sort of passive discontentment. For so long I believed it was normal for daily existence to be ordinary. During this time I owed my survival and sanity to fleeting moments of brilliance, snatched through rare displays of spontaneity. Desperate times call for desperate measures, so I’d do what any conservative soul would do on the verge of a mental breakdown; I’d chuck a sickie. Then, fuelled by the short fused euphoria of stolen time, I’d cram as much living as I could into that single evening. I’d stay up all night, playing music, painting, writing, drinking booze and end it all with a pre dawn stroll through the sleeping streets. Finally, utterly exhausted, I’d crawl beneath the folds of doona, just as dreaded first light forced its way through my bedroom window, reminding me that time never stops and that the previous evening was nothing but a self indulgent, pointless protest. I see now that setting my sights on a distant, romanticised future was my way of enduring what I felt was a deeply unsatisfying existence. But it doesn’t have to be that way. I’ve wasted the best part of my twenties learning a simple yet vital life lesson: if you want to wander off the beaten track, you will have to pave your own path. And for the first time, I’m doing just that. I didn’t know it then, but it was on those rare stolen nights that I was tasting the true essence of living; the rest was nothing but an empty waiting. Now suddenly my life has begun, and I have some serious catching up to do. I watched a speech by the late Steve Jobs this week. He was addressing an audience of young people at their university graduation. What he told them really stuck in my gut. He said that to live a successful life, you have to find what you love. He urged his audience to never settle, and to continue searching until they discover their passion. He stressed that this is the only way to ever be truly satisfied, so once you find what you love, you have to remain true to it, no matter how hard this might seem. I like it when someone successful says something like that. It reassures me that I’m on the right track; that as tough as it may at first appear, paving your own way is not only possible, but for a life worth living, it’s necessary. Until recently, my past has been filled with wasted present; years spent waiting expectantly for a future that never arrives. Now I finally understand that it’s impossible to exist anywhere but in the here and now. And you know what? For the first time in my life, that’s exactly where I want to be. There are very few topics that are almost certain to cause rifts and divisions, even amongst the closest of friends. Regardless of how delicately you approach the subject, you can almost guarantee that a discussion of religious beliefs will end with somebody feeling offended, marginalised or ridiculed; unless you’re fortunate enough to be talking purely with like minded individuals, in which case it will be less of a discussion and more of an open and shut ‘amen brother’ with either religious or ironic sentiment, depending on the company in question. Spirituality is something that we take very personally, as it’s a subject on which many of us have spent significant periods of time reflecting in order to articulate, at least on an internal level, how we feel and where we stand. My personal opinions on the matter are many and varied and have endured an almost constant state of flux over the years. The basis of my current convictions can be found below. NB I think it’s worth noting that the God to whom I’m referring throughout this text is the Christian God; the only one with whom I have any experience. Though I imagine the points raised may resonate for many religions, perhaps especially western varieties. If you are easily offended, perhaps tune out now. You have been warned. I was raised in an open minded household where we were encouraged from a young age to question the world as a way of formulating opinions that were our own. I was sent to Sunday School every week until I was twelve years old in order that I might be able to make an informed decision regarding my stance on religion. As a teenager, I frequented religious youth groups where the majority of attendees considered themselves to be devout believers (even if many were apparently more than a little confused about what this actually meant). So I guess it would be fair to say that over the years I have more than dappled with religion. I have a lot of respect for religious parables and the morals of the scriptures; that we should treat others how we would like to be treated and that we shouldn’t steal or lie or covet someone else’s missus are all good ideals by which I am happy to live. What I don’t like however, is this God character. The original Big Brother, this fellow allegedly has access to all of our innermost thoughts and feelings and is responsible for all the good stuff that happens to us whilst simultaneously staking no claim whatsoever over the bad stuff (which probably occurred as a result of our sinner status to either make us stronger or punish us, depending on which disciple you ask). I have serious issues with the notion that we’re all dirty sinners who need to be purged through devotion to some omniscient being who apparently created us as a trip for his own ego (‘worship me!’). This is psychological blackmail at its finest. When I was a little girl my mum decided she didn’t want a family any longer and so left for greener pastures, leaving my dad and us four kids to fend for ourselves. After being taught about the power of prayer at church, I prayed to God every night for longer than I can remember so that he might send my mum home. Of course, she never came back. According to the lessons taught at scripture, this meant one of three things: I wasn’t praying for something important enough, God didn’t think I needed the thing for which I was pleading, or I wasn’t a good enough believer to have my prayers answered. None of these reasons are without grim ramifications for the seven year old psyche. Instead, this God fellow wants us to believe in him for no reason other than just because. And for those of us who weigh it all up and conclude that we think the notion of an afterlife is pretty far fetched, and that the scientific explanations of things sits more comfortably with us? We are punished by an eternity of fire and brimstone. Nah, man. Not cool. After fighting with God for so many years, one cannot help but feel a little exhausted. So recently I made a peace with the topic of God and this has resulted in my achieving a genuine sense of inner calm regarding this issue. You see, I have always been a spiritual person, if in a very secular way. Every morning when I wake up, I fill my lungs with air and smile that I am alive. I go for walks in the evenings and get so filled with the beauty of things that I get this uncontrollable desire to yell really loudly and hug perfect strangers with a firmness that could be disarming. Seeing the moon glowing up in that crazy blue and the waves thundering onto the shore overwhelms me to a point of breathlessness. Since time and memoriam religion has had this fatal ability of dividing us all. Surely in the twenty first century we have the mental tools required to realise that as a collective humanity we have more commonalities than we do differences and that this truth extends to religion. For me, there is no God in the sense that the Bible dictates. Rather, God is simply a metaphor created to explain to small children the divine nature of life. In which case, God is neither good nor bad. She doesn’t favour righteousness over other human conditions, she doesn’t punish or reward and she has no idea or interest in what you are thinking. In saying that, she is very beautiful, and without her we wouldn’t be here. It’s time to stop being accountable to archaic scriptures and the conventions of organised religion which were set forward to control the masses all those years ago. The folks of the past were unwillingly the ignorant and the indoctrinated. In the twenty first century, the Bible should be considered nothing more than a literary masterpiece and an historical artefact. At this pivotal point in the pilgrimage of humanity, let’s take charge, and allow our minds to be the key to our freedom.